My husband is awlays outside. Spring, summer, fall and winter, you name it, he is outside. We moved in our new house last January. I was always finding coveralls and coats laying by the front door, so I decided a coatrack was a must. I have been in to DIY projects latley. 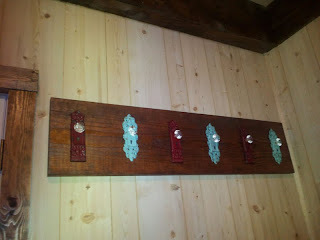 I decided I would try and make my own coatrack with the assistance of my husband, of course. Aferall, he is the handy one in our family. It is now April, but we finally got around to making the coatrack last week. It was SUPER easy and inexpensive. Was going to get those same knobs but with the brown back to hold my curtains back but they were too small :( LOVE how this turned out! !